For the first time in SA, an unforgettable, adrenaline-charged family event. They’re big, they have a powerful roar, jump up to 9 meters high and move at speeds of up to 110 kilometers per hour. That’s right, Monster Jam, is bringing their monster trucks to Cape Town. A first in SA, this event is your chance to see Monster Jam trucks race and carry out gravity-defying acts and punishing stunts and tricks. To join in the fun, get your tickets at Computicket then get to Cape Town Stadium, Saturday 27 April, 6pm sharp. Visit monsterjam.com for more info. 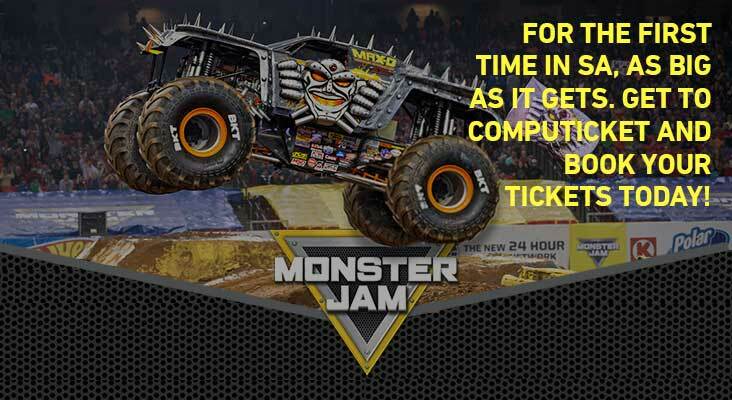 Monster Jam brought to you by Showtime Management in association with KFM 94.5. The most adrenaline to make you feel great.